As a blog author, I am intrigued by what posts strike a nerve and what posts do not. Apparently, (some) people have strong feelings (to use a phrase from my children’s preschool) about Lectio Divina. The concerns I’ve heard are that it opens the door to Satan, it results in a subjective understanding of the Word, it leads to New Age spirituality, and so forth. Some people are very concerned about Bible reading and prayer that involves a time of quiet meditation. As I read their concerns, my perception is that when reading the Bible, in their opinion you should only be reading or speaking prayer, but not sitting or waiting in Scripture quietly. Stopping to sit in Scripture and pausing in prayer to hear from God through the Word are viewed with great suspicion as a time that opens us to deception by Satan. I find that entire concept foreign, and I think it is because of my own theological convictions that I do so. 1. Perseverance of the saints. I believe with the Apostle Paul that He who began the good work in me will continue it (Phil. 1:6). My conviction is that God keeps me, and I am not afraid that Satan will pluck me out of God’s hand (John 10:28). I am definitely not afraid that Satan will pluck me away from God through my own personal Bible reading. God says He’s not going to lose me, and He’s left the Holy Spirit within me as the deposit to ensure that outcome (Eph. 1:14). 2. The value of memorization and meditation on the Word. God’s Word is a lamp to our feet and a light to our path, the psalmist says. The psalmist then commits to hide God’s Word in his heart (Psalm 119:105). How do we hide God’s Word in our hearts? We memorize it by repeating it to ourselves. Repetition of God’s Word is a normative, healthy Christian practice! Now some are concerned with repetition of small portions, like a word or phrase, of Scripture. I don’t see that as the thrust of listening prayer and Bible reading. The particular instructions I suggested and have used for myself focus on a passage around 12 verses, reading through the entire passage repeatedly. While one may zoom in on a particular word or phrase, it is in the context of its place in a larger reading of Scripture. In short, if you are concerned with someone repeating a single word from Scripture in an eastern type trance, fine. But don’t project that onto my post in particular. And in general, I don’t think that’s a fair concern for most modern evangelical discussion around listening Bible reading and prayer. That seems a straw man that is irrelevant to what is actually being discussed — slowing down in Scripture reading to let God speak to us through His Word. 3. An inflated understanding of Satan. Critics seem more worried about Satan than they are confident in the Holy Spirit. I keep thinking of I John 4:4, “Greater is He that is in you, than he that is in the world.” We are certainly instructed to be cautious of Satan (for instance Paul’s instructions in Ephesians and Peter’s of Satan walking about as a lion seeking to devour). But those warnings have Satan on the outside, not talking to us from the inside. That’s pretty important! If you are in Christ, you have been SEALED by the Spirit (Eph. 1:13 and 2 Cor. 1:22). Now people debate what exactly it means to be sealed by the Spirit, but it means something. My conviction is that it means that we are safe in the Spirit — He is the guarantee of Phil. 1:6, that God will not default on His promises to us, and Jesus loses none of those God gives Him. God took both sides of the covenant with Abraham, and He has taken both sides with us. We are safe in Him because HE will not default on His promises to us. Furthermore, it is the SPIRIT not Satan that lives within me. While Satan can and does taunt me from the outside, the Bible never talks of him as indwelling us or speaking to us from the inside. Again, the phrasing of being sealed by the Spirit is helpful. A seal locks the letter with the stamp of the king. Seals remove openings that allow contaminants to flow into an object or that allow seepage out of the object. We are sealed in the Spirit. Exposit that and then think of the implications! Consider also that when Satan approached Eve and later when he approached Jesus, while he did use God’s Words against them, he did it externally. He did not come internally into their psyche, and I would argue strongly that he is unable to do that to any who are in Christ Jesus, sealed by the Spirit. Satan can possess unbelievers from the inside. And he can oppress believers from the outside. But I see no Scripture that warns of a Satan that can speak inside of us once we are in Christ and sealed by the Spirit. The Bible presents a dangerous Satan, but not an omnipresent and omniscient one. That’s God, not Satan. If you are in Christ, you do not have Satan and the Spirit inside of you dueling it out. THAT is a bad teaching, and those knowledgeable in theology should know better than to entertain that idea. I am a big proponent of expositional Bible preaching and teaching. I employ it even right now as I think about why an expositional understanding of Scripture protects us from fear of a Satanic voice that can lead us astray from Scripture from the inside. Satan may attempt to use someone outside of me misusing Scripture to deceive me, and in that event it is important to understand Scripture objectively to ward off such bad teaching. But if we are in Christ and sealed by the Spirit, the Spirit within us is greater than our opponent outside of us. It is in that framework that I can come to God in my Bible reading and confidently listen for Him to speak through His written Word to me. I hope something there is helpful to you as you think of how to approach your own personal Bible reading and prayer. Thanks, Wendy, for posting a follow-up to your previous article. It's good to see that one can be so certain of one's view on an issue. I have to push back a bit, though, if that's OK. There are several things in this article that don't seem to address the negative comments on the previous article. I think the majority of comments had to do with the dangers that the commenters (me included) see in Listening Prayer and the Lectio Divina practice. None of them mentioned anything about losing your salvation, that I can recall. But in many of your statements and scripture references in this article, you refer to salvation issues. You also made it very clear that your conviction is that if you hear a voice (literal or figurative), that it can only be God. I don't remember without looking whether you warned or if it was another commenter, but there was the warning to compare what you hear to Scripture. If God is the only one who can be talking to you, then certainly there's no reason for comparison. God cannot speak anything but complete truth, and anything he says is, by definition, scripture. I don't agree with you that Satan (by Satan, I mean any evil spirit) cannot influence your thoughts. As you pointed out, Satan prowls around seeking someone to devour (though that was Peter's warning, not Paul's). In its context, it's a warning to believers, and in the same sentence we are told to be sober-minded. “Be sober-minded; be watchful. Your adversary the devil prowls around like a roaring lion, seeking someone to devour” (1 Peter 5:8). While I don't believe there are any statements in the Bible that blatantly say that Satan can speak to your mind, that warning from Peter certainly seems to point in that direction. You said that because we are sealed by the Spirit of God, then we are safe from evil spirits speaking to our minds. I believe that is a poor understanding of the passages you cited. All of the passages you cited regarding being sealed by the Holy Spirit are in the context of salvation. And, again, no one was speaking of the danger of losing your salvation; that was never at issue. You also seemed to have a problem with the idea that Satan and the Spirit are inside of each of us dueling it out. I have the same problem with that notion that you do, as I suspect the previous commenters would as well. I don't remember that ever coming up. Again, you're arguing against statements that were never made. It seems obvious to me that people can be deceived and come to incorrect conclusions regarding what we read in the Bible. After all, we're having this conversation now; one of us is incorrect on this issue. Being indwelt with the Spirit of God is no guarantee that we cannot be deceived. I stand by my view that Lectio Divina is dangerous and is nowhere taught in Scripture. We are never taught to sit and listen for God's voice. That is simply an unbiblical concept. Meditating on Scripture is a very useful and healthy thing to do, but that includes reviewing and pondering Scripture, not sitting and listening for God to speak to us in some subjective manner. We are never taught to seek personalized, private messages from God in prayer or in our reading of Scripture. A Bible passage cannot mean what it never meant. The meaning can only be understood as the meaning that the original author meant to the original audience. My purpose in this critique is not to demean you or to cause you to do anything other than rethink your position. If this was a minor issue, like whether or not infants should be baptized, then I'd have no reason to put time and effort into writing about this. But I agree with other commenters that this is a dangerous practice that should be avoided. Thanks, geojono. As for the perseverance of the saints doctrine, every criticism has voiced concern that the practice will lead to a New Age type mysticism/spirituality, which is non-Christian. So my argument is that if we are in Christ and believe in the perseverance of the saints, we are freed from that particular concern. You said that “meditating on Scripture is a very useful and healthy thing to do, but that includes reviewing and pondering Scripture, not sitting and listening for God to speak to us in some subjective manner.” But I wonder how you approach Scripture on a principle that you are wondering how to apply in your own life? For instance, when Titus talks of being a “keeper at home,” it doesn't give specific, objective application. So each believer is left to pray through it and apply it as the Spirit convicts us, which one could call a personalized, private message from God. However, when I receive my “personalized, private” message from God while praying about that passage, I know that it will also submit to God's word, that the Spirit won't convict me in how to be a “keeper at home” in specific ways in my particular home by saying “don't be a keeper at home.” However He moves me to apply it, it won't deny the Scriptural principle. However, I am very comfortable with the idea that He will convict me specifically in ways that are relevant to my life and my home, which in some sense is personalized and private and different from your application in your home. The 2nd sentence should say not every criticism but much criticism. Having grown up in the “reformed” church I have benefited from much expository preaching and dissection of God's word and its application to my life. I have also found Lectio Divina to be a valuable tool in exploring God's word and its application. This does not mean I throw out my discernment or knowledge that my previous learning has taught me but it is an additional tool the Holy Spirit can use, and in my experience it has been a meaningful one. God asks us to discern and ask for wisdom. This is true whether the voices we hear are from a neighbor next door, from a voice in our head or from a blog post. I am thankful for being introduced to this deeper exploration of scripture and would encourage no one to fear it but use it trusting the same Spirit of Truth to guide and protect. 4 But Jesus, knowing their thoughts, said, “Why do you think evil in your hearts? 5 For which is easier, to say, ‘Your sins are forgiven you,’ or to say, ‘Arise and walk’? Your first paragraph is, again, talking about salvation. If I read that I'm to be a keeper at home and then I decide that what that means to me is that I'm to be a hoarder and “keep” everything, never throwing anything away, you would rightly claim that I'm misinterpreting that command. But if I believe that the Bible is telling me to be a hoarder (I don't, this is just an example), does that mean I'm a non-Christian? No, it just means I'm confused and perhaps misled (deceived?). Falling into New Age practices doesn't mean a person is no longer (or never was) a Christian. It simply means that they're confused and they need to repent and learn the way of God more acurately. Again, we're talking about interpretation of Scripture, not salvation. When I said that proper Bible study method includes the rule of thumb that a passage can never mean what it never meant. I was talking about interpretation, not applcation. Interpretation asks the question: What does it mean? Application asks the question: Now that I know what it means, what is a proper application to my life? There can only be 1 interpretation of a passage of Scripture; it can only mean what the original author meant. There can be many applications, however, which is what you're describing. Faulty interpretation leads to faulty application most of the time. Two quick examples that I think point out improper uses of the Bible regardless of what voice the reader might hear. 1. A man reads in Acts about the Philippian jailer getting saved. Paul tells him “Believe in the Lord Jesus, and you will be saved, you and your household.” He listens for God to tell him something from this and then he gets excited because he feels that God tells him that he's going to save his family in virtue of this Biblical promise. I'm saying that he cannot read this verse and claim that promise for his own family. He can't say, “thank you, Lord, that you've promised to save my family.” That's not his promise. When Paul said that, and when Luke wrote that in Acts, he never meant it to apply to anyone but the Philippian jailer. 2. A single Christian man today feels attracted to a single Christian woman in his church whose name is Grace. He reads his Bible prayerfully and comes across the line “Grace be to you.” He focuses in on that phrase and feels that God is telling him that he should ask Grace out on a date for God is giving her to him as a wife. I hope you would see that this is not a proper interpretation of that phrase in the Bible, and that God is not telling this man that he's giving Grace to him as a wife. What I can gather from example #1 for my own life is that God is loving and wants to save people. I can gain strength from that and courage to witness to people, my family and others. If I think I hear God telling me that based on that passage he's going to save my family, that's not God speaking, because it's an imporper use of the text. If I hear that voice I reject it. I appreciate your desire to set my perspective straight, but the name Lectio Divina is not poisoning my understanding of the problem. With the exception of Jesus' very metaphorical example of us as his sheep listening to his voice for salvation, we are never commanded to listen for God's voice when we pray or read Scripture. The Bible is God's message to us. Prayer is our way of speaking to him. The Spirit certainly convicts us, but that's in terms of general principles gleaned from our study of the Word. I know this is a popular practice among Christians today, but there's no biblical basis for it at all, and I think it's a dangerous practice. Simply because some misuse a practice due to immaturity or deception, that does not preclude the total abandonment of a discipline. As Wendy stated, Satan should not be given credit for our own fallen minds that need to be renewed and submitted to Christ. Our thoughts are just that, ours, and part of meditation is being still and reflecting on Scripture so that it is His thoughts we dwell upon and not our own. Those who completely discredit eastern spiritual practices have forgotten one thing Satan does do– twist the truth to deceive. Meditation is not an invention of Satan, but a subtle twisting of what God instructs His people to do. If one is filling her mind with Biblical truth, listening and thinking on that truth, then confirming the validity of her conclusions based upon Scripture, that is a depth of maturity and spiritual discipline that more should practice in our overwhelmingly busy world. Eastern meditation empties the mind and focuses on self; biblical meditation and prayerful listening fills the mind and focuses on the Father. We need to take care to not abandon one for fear of the other. Geojono, I'm not sure what you mean by falling into New Age practices, but the fundamental concerning issue of New Age spirituality is finding God (or a god or spirituality in general) apart from Jesus Christ. Perhaps your concern about listening prayer is different, but many of the criticisms I have heard center around a fear of falling into New Age beliefs, which are inherently unchristian. In that sense, the issue of whether a true believer can be lost to unbelief seems very important. It seems that lectio divina might allow for one's own ideological commitments and false impulses to lead one away from the truth–if it were the only way a person practiced seeking Christ through the scriptures. If it is practiced as part of a “balanced breakfast” including inductive study, wise counsel, orthodox preaching, reference to the historic creeds and traditions of the church, it's hard to imagine things going too far wrong. A wise friend also pointed out to me today the logical fallacy of saying that because some people have been led astray by such meditative Bible reading that we should not do it at all. Think of all the Christian practices we would have to shelve for that reason. Because some people treat communion as …. Many churches that use expository preaching are unhealthy. But I'd never use that as a reason to shelve expository teaching. Thanks again for your reply and your willingness to discuss. At this point I am willing to drop the discussion as an issue on which we will simply disagree. However, I do want to give you a couple of resources about New Age teachings that you might find helpful. The other is a book: Encyclopedia of New Age Beliefs by Ankerberg & Weldon (Harvest House Publishers, 1996). That's a great article. Thanks for sharing, Twiga92. My concern is not that people want to be careful of Satan, in fact any person that doesn't have a healthy concern of Satanic attack that reflects Peter's and Paul's warning is ignoring Scripture. My concern is what I feel like is an unbiblical and downright harmful fear of hearing Satan, not the Spirit, when we quiet our heart to read Scripture and pray. Yes, this is very helpful to me. Thank you Wendy! 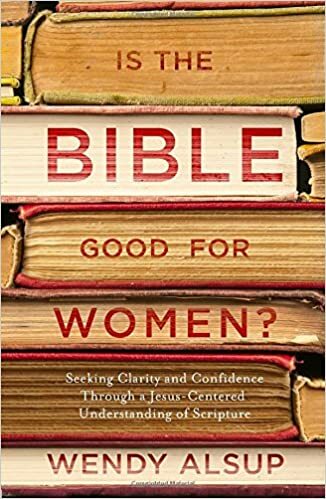 Is the Bible Good for Women? available now. Wendy Alsup is the author of Practical Theology for Women, The Gospel-Centered Woman, and By His Wounds You Are Healed. She began her public ministry as deacon of women’s theology and teaching at her church in Seattle, but she now lives on an old family farm in South Carolina, where she teaches math at a local community college and is a mother to her two boys. She also writes at gospelcenteredwoman.com. She is a member of a local church in the Lowcountry Presbytery of the Presbyterian Church in America. If you subscribe by email, you will receive no more than two posts a week from this blog. The Christian Gospel is that I am so flawed that Jesus had to die for me, yet I am so loved and valued that Jesus was glad to die for me. This leads to deep humility and deep confidence at the same time. It undermines both swaggering and sniveling. I cannot feel superior to anyone, and yet I have nothing to prove to anyone. I do not think more of myself or less of myself. Instead, I think of myself less. If you have a negative comment, please be sure to give the benefit of the doubt on motive or tone to the blog author or readers who comment. Anonymous comments are welcomed only if you need a safe place to be honest about a burden or concern that you don't feel free to share with your name. Anonymous critical comments will be deleted immediately. If you need to respond critically, please use your name. Comments automatically close on posts over 30 days old. © 2016 - Wendy Alsup - Site by Mere.